Fringe reception is the term used to describe the edge of a satellites reception footprints. Satellites do not broadcast in nice clean rings as shown on official reception maps, signals can vary greatly from area to area, or depending on whether you are east or west of the official reception map (footprint). Satellite signals do not however stop at international borders and ‘overspill’ will occur even on the tightest of beams. This is the situation overseas viewers will encounter with the reception of the Astra 2E, 2F and 2G satellites, these are used by all the main PSB broadcaster, the BBC, ITV, Channel 4 and Channel 5. There can often be variations from transponder to transponder and from horizontal and vertical polarization. 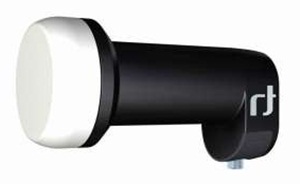 All links in the reception chain are vital, the correct size dish, the best LNB, LNB skew, good quality cable and of course a good quality satellite receiver with the lowest possible threshold. The threshold is the lowest level of signal required by the receiver to produce a watchable picture. In fringe areas, reception is not guaranteed by the satellite operator, or the channels using the spotbeam, this is not the intended area of coverage. The UK’s Public Service Broadcasters (PSBs), broadcast most of their services Free-To-Air (FTA), in the clear or unencrypted. British broadcasters have the rights to transmit programming to the United Kingdom and the Irish Republic. To prevent their services from being received outside the intended area of reception, they use the UK Spotbeams on the Astra 2E and Astra 2F satellites. Dish size is paramount in the reception of weak signal outside intended reception areas.. 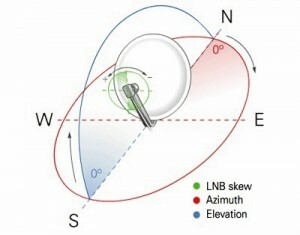 This determines how much of the weak signal from the satellite is gathered for the LNB. If insufficient signal is collected enough signal for the receiver. Theoretically, the lowest noise figure obtainable from any device is limited by any components in the signal chain with the highest thermal noise. The first component in the chain would be the detector circuit and on a Universal LNB this would be a pin diode. At Ku band, the detectors are rated at manufacture to about 40K which converts to a figure of 0.5 dB. Presently the LNB market is active by those selling what appears to be an extraordinarily good device, some use the best of the component batch – and end up with good performance overall (rare). Some modify existing LNBs by the use of fancy smoothing circuits to eliminate any further incoming noise from the power supply – there are definite improvements when used with cheaper receivers, especially those with switch mode supplies (few). Some simply take the lowest noise figure during tests at a particular frequency and then claim that this is the figure of the LNB (so you could have a 0.5dB LNB at 10.8GHz which has a 1.1dB noise figure at 11.6GHz, however, it will be rated at 0.5 (depressingly common). The LNB gain tells us how much the incoming signal is amplified before being sent off down the coaxial cable to the receiver. The range of gain specified is between 40dB and 70dB (somewhere between 10,000 and 4,000,000 times the incoming signal power). At first sight, the highest gain you can get would be the obvious thing to look for; however, that is not the only criterion when it comes to LNBs. 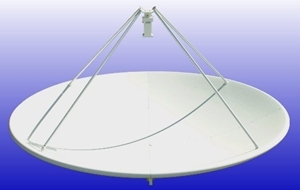 When you have a large dish looking at high power satellites like Astra 2A and Astra 2B, the gain can be so high that the receiver is overloaded with signals. These can ‘swamp’ the lower powered satellites signals. Even if the receiver itself can handle a massive amount of signal, there can be problems within the LNB itself when large amounts of amplification are employed. This leads to the generation of spurious signals and distortion. This distortion will interfere with the reception of your signals. To let the demodulator in the receiver work effectively, the gain at all frequencies should be the same. This is not a very difficult requirement to meet, except perhaps at the edges of the band, as long as the LNB is constructed properly. A FEC of 9/10 means that just one-tenth of the data is used to correct errors, making the signal harder to receive and much less robust. It will break up more easily in weak signal areas, or when subjected to interference. For the broadcaster, 9/10 means that more channels can be squeezed in, at a higher data rate. The difference between FEC 2/3 and FEC 9/10 is that an extra 4.5dB ES/No is required to stay above threshold. Currently, most UK PSBs use a FEC of 5/6, which is not very robust in fringe areas. The Symbol rate is measured in baud (Bd) or symbols/second. ks/s is 1000 symbols / second. KHz is 1000 cycles / second. The most common Symbol Rates used for British TV and radio are 22000 and 27500, BBC HD channels use a SR of 23000, while Sky HD tend to use 29500. 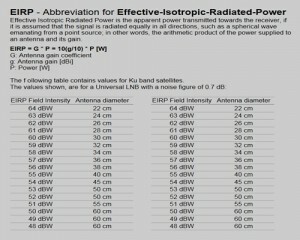 Effective Isotropic Radiated Power (EIRP) is derived from the word isotropic which means equal in all directions. 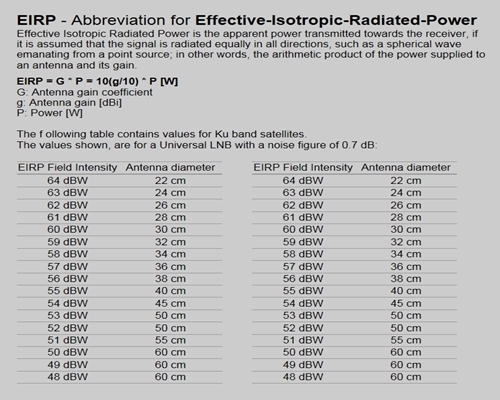 Effective Isotropic Radiated Power means the power levels that would be received at any location if an antenna were radiating equally in all directions. Therefore, a 37 dBw EIRP reading means that a perfect antenna would direct 37 dBw or 5012 watts per square meter in all directions. Official satellite reception maps (footprints) have very conservative values, this is good if you are inside the official reception area, as it is easy to determine the dish size required for reliable reception. However, satellites do not transmit in the way they are displayed on official footprints, so outside the intended reception area, it is mostly guess work. Quasi Error Free (QEF) The point where the signal quality is enough to give stable reception, a level of errors that is defined as the “threshold” of where the system is working and where it is not. The “threshold of visibility” is another term sometimes used referring to a rate of errors that just becomes noticeable to a TV viewer. SNR (also S/N) is the signal to noise ratio. This is related to CNR, but usually is only applied to analogue signals. It is the power ratio (again usually expressed in dB) between the received (and demodulated) wanted signal power in the baseband bandwidth and the thermal noise at the demodulator output in the same bandwidth. For example, in an analogue FDM/FM voice multiplex carrier the CNR would be measured in the bandwidth of the whole carrier but the SNR would be measured in the 4kHz bandwidth of one voice channel.